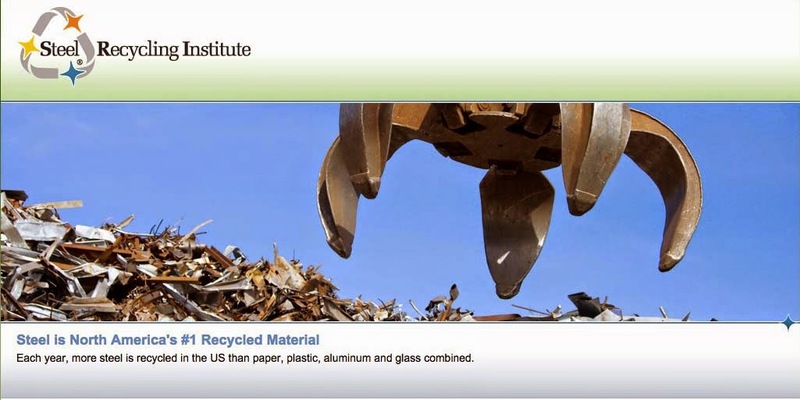 Today I saw an article By Melissa Hincha-Ownby pushed through 1800Recycling.Com comparing steel and aluminum recycling. The article seemed to start with the assumption that putting one item in your curbside recycling bin would be any easier than placing another. Recycling paper products is as easy as putting them in your recycling container and dropping them off at a neighborhood collection center. Unfortunately, recycling metals isn’t always as simple. Fact is, that the vast majority of Americans have very easy, convenient access to recycle many common household materials, including paper, plastics, glass, aluminum and steel. Not a single one of the materials are more difficult than others to put into recycling bins--unless you get into having to separate different types of papers, plastics and/or glasses. According to the Steel Recycling Institute, steel is the most recycled material in North America, due in part to the fact that steel (like most of its metal counterparts) can be recycled infinitely and it is used in a variety of applications and industries. While a good portion of steel comes from the commercial sector, there are also residential sources for steel recycling, including appliances and the steel in our autos. Steel is indeed the most recycled material in the world, and it's definitely not because it is difficult to recycle. Fact is, that the steel food can (which the article forgot to mention) has the highest recycling rate of any food/beverage package at 65 percent. This is largely because the steel can is recyclable through more than 95 percent of our nation's curbside recycling programs. In fact, more than 150 million Americans have convenient curbside access to recycling steel in more than 7,500 curbside programs. And, that's just the cans. However, recycling an old refrigerator or the rust bucket in the back yard isn’t exactly quick and easy. There are hazardous waste guidelines that must be adhered to, so you’ll have to do some research to find a scrap metal recycler in your area that can take these items off your hands. Once you find a location, you’ll have to tackle the challenge of transporting the item. While steel is the most recycled material in North America, it isn’t the easiest to recycle. Consumers rarely, if ever, have a direct hand in recycling their appliances or cars. It's left to the professionals who have made it quite easy for consumers to offload their cars and appliances. When cars get their last trade-in, or if they're taken to the "junk yard," their cars are actually being dismantled for any reusable parts, stripped of any wastes or non recyclables, then shredded into fist-sized chunks of steel, and, yet again, recycled. This is entirely handled by licensed professionals and it is as easy as a trade-in or a trip to the scrap processor to start the recycling process. It is also quite easy for consumers to recycle their appliances. Most often, consumers send away their old appliances with the delivery company that brings their new appliance. It's that easy for them. These delivery companies take the appliances, in bulk, to processors which efficiently remove any refrigerants and non-recyclables. And, like their car cousins, they are shredded into small chunks of steel which are recycled as well. On the opposite end of the consumer-recycling-ease spectrum is aluminum. Aluminum isn’t heavy, so there isn’t going to be a significant cost to transport the product and most residential recycling programs readily accept aluminum cans. Most consumers aren't toting around their recyclables. The same, rare consumers that MIGHT carry them around would find similar ease in recycling their steel food packages as their aluminum beverage cans. For the most part, aluminum is one of the easiest metals to recycle from the consumer standpoint. Too bad steel isn’t as simple to recycle as aluminum. Melissa really should've done her homework here! Steel is very easily recycled because of its magnetic attraction. Therefore, steel cans, as well as all forms of steel scrap, are easily pulled from any commingled recyclables or other non-recyclables, by magnets. No sorting needed like paper, plastics, aluminum and glass. The separated steel is efficiently used by steel companies to offset the consumption of raw materials and even energy. So, there is a reason that more steel is recycled each year than paper, plastic, glass and aluminum combined -- it is because steel is easy for all to recycle. Just in case you need help in finding a location to recycle your steel, check out the Steel Recycling Locator. The Locator tracks more than 30,000 steel recycling options throughout the US and will tell you the location closest, and easiest to you to recycle your steel. We are always available to help you learn the facts about steel recycling. Please do not hesitate to contact us. I've recently found some bulk metal recyclers in Calgary, it's not always as simple as putting it in the bin, but it's still relatively easy.